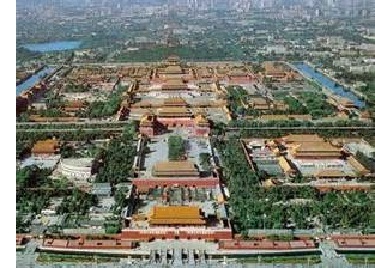 Beijing - Beijing is the present capital of China and has been so for most of the past 700 years. Its history goes back to about 1000 B.C.. When China was unified by the first emperor (see Qin Shi Huang), it was the provincial capital of the state of Yan. Its geographic location in the North made it strategically important both for launching invasions as well as defending against them. When Kublai Khan founded the Yuan Dynasty, he moved the capital from Hangzhou to Beijing in 1279. Back then the city was named Dadu which means "grand capital", and its population was around 150,000. The name was changed to Beijing (which means "Northern Capital") 600 years ago during the Ming Dynasty (up until 1982 it was called "Peking" in the West until the adoption of the Pinyin Romanization system, as opposed to Postal Map Romanization). The famed Forbidden City (which will be covered later on this chart) was also built in Beijing under the Ming. It would serve as the capital through that and the Qing Dynasties, as well as the present People's Republic of China. Today Beijing is the second largest city in China (after Shanghai) and one of the largest cities in the world, with a metropolitan population of 21 million people.